SKU: hopeframe. Category: Hope Series. 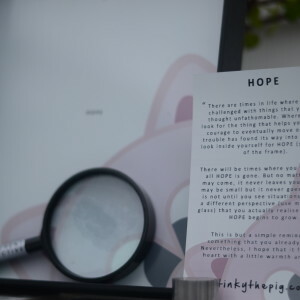 Tags: frame, hope series, stinky. The limited edition Hope Series is perfect to display around the house or to give as a gift to someone needing the little extra push back on the road to recovery. This piece is a little different to the usual gifts as it comes with a story and well wishes. Imagine describing what it is to your friends and family. We are sure it will raise a few eyebrows. 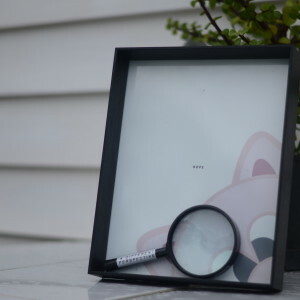 What you will receive is a 20cm x 25cm frame with the illustration, a photo card and a functional magnifying glass. There are times in life where you are challenged with things that you once thought unfathomable. Where do you look for the thing that helps you find the courage to eventually move on? When trouble has found its way into your life, look inside yourself for HOPE (see center of the frame). There will be times where you think that all HOPE is gone. But no matter what may come, it never leaves your side. It may be small but it never goes away. 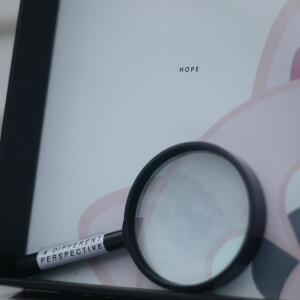 It is not until you see situations through a different perspective (see magnifying glass) that you actually realise that your HOPE begins to grow. This is but a simple reminder of something that you already know. Nevertheless, I hope that it fills your heart with a little warmth and love.